1892: Goes with his parents to the theater Honjo Kotobukiza and watches a performance of Yoshida Otono’s <i>Maneku Furusode</i> (An Inviting Kimono Sleeve); the scene of torture leaves a profound mark. 1919: Starts the <i>Kaidan Kai</i> (Ghost Stories Society) in Hyakkaen park in Mukojima, Tokyo along with Hirayama Rokko (1881-1953) writer, Miyake Kogen　(1886-1951) writer, (Izumi Kyoka (1873-1939) writer, Kubota Mantaro (1889-1963) writer, Kinjo Saitenzan III (1863-1935), Kaidanka, Ii Yoho (1871-1932), Hanayagi Shotaro (1894-1965) actor. 1921 (June): With Kisei now pregnant, makes the <i>Rinketsu Bijin Sakasa Tsuri no Shashin</i> (photo in inverted suspension of a beautiful woman in her last month of pregnancy). 1921: Suzuki Senzaburo (1893-1924), a theater writer, publishes <i>Hi Aburi</i> (Burnt by Fire), a play based on the life of Seiu Ito. 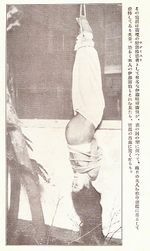 1924: Publishes in the <i>Sunday Mainichi</i> photos of torture of Kisei; acquires a reputation for perversion.